I find a lot of people want to bite off more than they can chew when it comes to starting a second business. The question is, is there ever a right time to get a second company off the ground? Here’s the thing – my advice would be, never start a second distraction until the first distraction is under full management and is producing consistent and sustainable results without you being there for extended periods of time. But, typically when people start doing something else, they take their eye off the prize. And then the prize starts to fall apart. That’s where the problems begin, which can quickly turn serious. The challenge that you have is that if you launch a second business and your first business starts developing problems, you don’t have the same level of time and focus to work on the issues of the first business because you now have the distraction of the second business. That is something to be very cautious of. And don’t get me wrong, there are some people who can do it without any problem, but that’s certainly an anomaly not a standard situation. 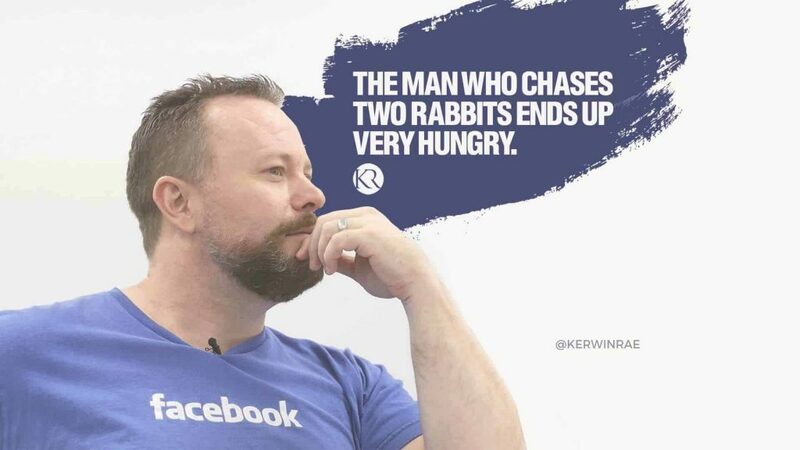 Remember, the man who chases two rabbits ends up very hungry. Let’s say you have a watering can, and the water you have in your watering can is a metaphor for your attention. You have limited attention in that watering can, but enough to water one plant every single day to ensure that it stays healthy, strong and growing at a nice rapid pace so that it can supply the fruits when required that’s going to give you everything you need for you and your family. So now let’s introduce a second plant, but you’ve still only got one can of water. Those plants are only going to get half the amount of water required. Or one will get 20% and the other will get 80%. Ultimately at the end of the day what’s going to suffer? The plants. Whatever we give our attention to will expand. So personally speaking, I would only ever consider a second business if business number one was strong, profitable, and had layers of leadership and management in place so you could literally take six months off and upon returning, everything would be in the same, or in an even better position than when you left. If you can do that, then you might be in a position to start considering a second business. I like your article, very valuable.I have a question for you. You have any idea how Elon Musk is doing, what he is doing? He is running SpaceX,Tesla,SolarCity,openAI and also the tunnel project at the same time. Do you think Elon is an exception?He himself says running two companies is not good, but he does it anyways and all the companies are growing.What do you think about him? He couldn’t do that without a really good team.